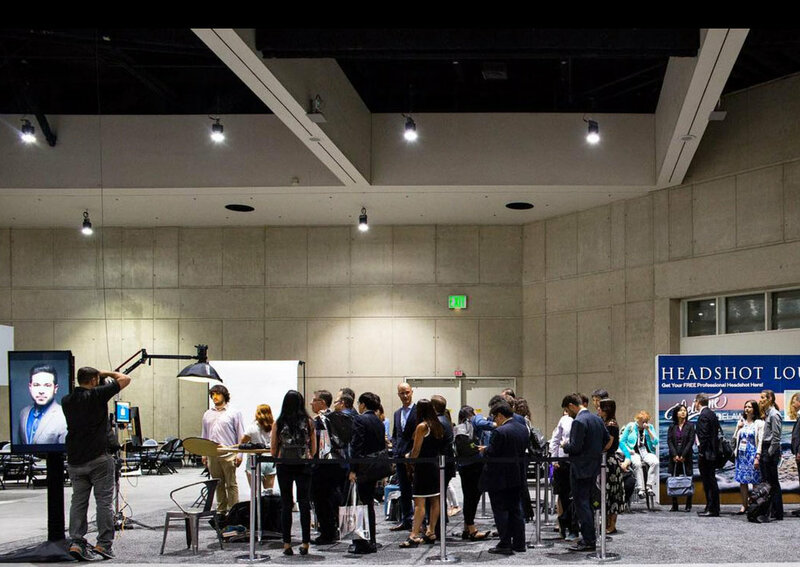 The Two Dudes Headshot Booth is one of the most effective tools you'll find for driving traffic to your exhibit booth at Conferences and Trade Shows. We offer several packages that scale in size and spectacle, but none of our packages ever compromise on quality. And even our most basic Standard Set is an incredibly effective tool for driving traffic, capturing custom lead data, and making a positive impression on show attendees. 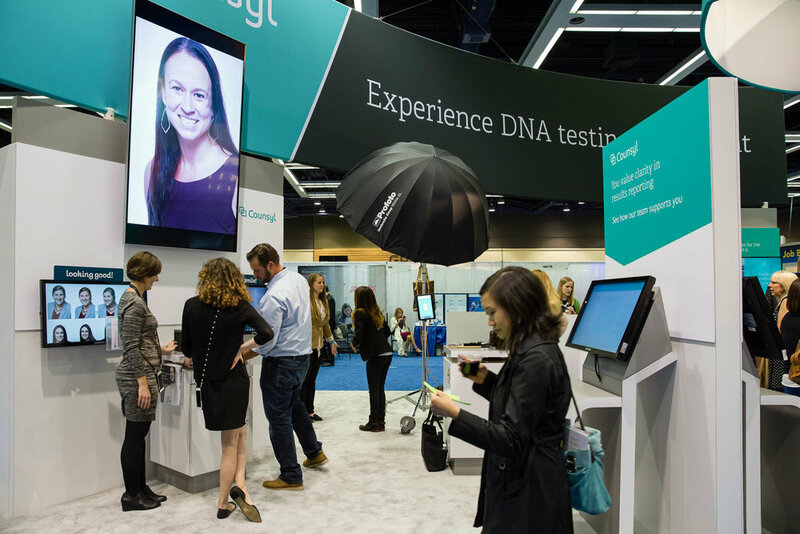 By itself, the Standard Set will draw a crowd; pop us in an empty spot in the room, and you'll soon have a (quickly moving) line of people filling out our branded data capture form and waiting to speak with one of your salespeople. Give us an empty spot on the floor, and we'll give you a crowd. We do offer several larger packages, and can build out anything you can dream of (like our Vanity Fair experience for Kia), but these packages tend to come with a higher price tag, as they require us to freight more equipment, send more staff, and spend more time producing the elements of the custom experiences. 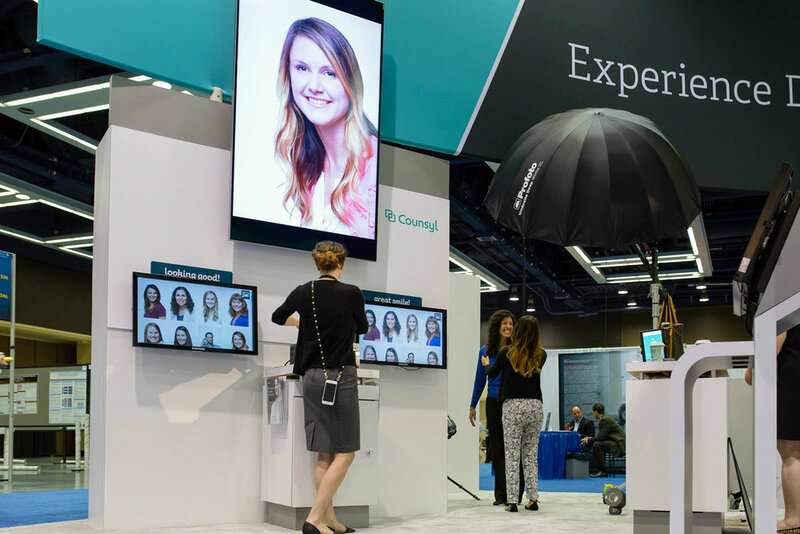 One of our clients, Counsyl, figured out a clever, scrappy way to expand the size and scope of our Standard Set, by simply building out their exhibit space with our headshot booth as the focal point. I know what you're thinking: yes, but they had to take on the costs of building out the booth! That's true; however, as we all know - all budgets are not equal. Counsyl knew that they already had a substantial budget line item for their booth construction; on the other hand, they did not have a huge budget for photography, so this allowed them to magnify the impact of our Standard Set while keeping the additional photography costs down. 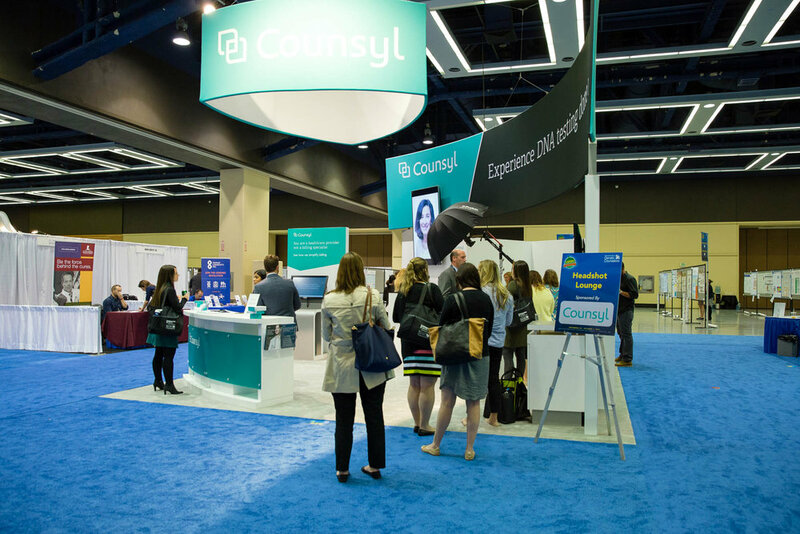 In the months up to the event, we worked closely with the Counsyl team to design an exhibit layout and experience that would maximize traffic to the booth, while also ensuring that guests had optimal exposure to Counsyl's services. We also identified the key information that Counsyl needed to know about each attendee in order to qualify them as a lead. This way, as guest checked in on the custom sign-in form we developed, the Counsyl team would know (in real-time) who was in line and whether they were a strong lead. As guests approached the Counsyl booth, they would be greeted and invited to sign-in at the front desk. Counsyl did a great job of walking the (quickly moving!) lines to greet/connect with people and get them signed in...so many of our clients miss this opportunity to connect with people more in-depth. Side note: If it looks slow in the hall, it's because these photos were taken an 30-60 minutes before the show floor opened...these were people who snuck in to try and beat the rush! In their booth buildout, Counsyl built a small corner in their booth with a white (matte, non-reflective) wall for us to use as a backdrop. This allowed us to leave the backdrop stands at home to keep the area nice and clean. Counsyl also provided a separate area with an 80" vertically-mounted 4k TV and two large wall-mounted touch-screens for us to use as sharing kiosks. When folks were finished getting their portrait, they would step over to the opposite side of the booth, where they would be greeted by another Counsyl staff member who would hand them their branded printout (an add-on to consider), and assist them with emailing their images. Guests also observed a live slide show of the headshot's we'd captured, along with branded marketing images that were interspersed. Again, Counsyl did a really great job of always having 1-2 staff stationed at the end of the experience to greet people as they exit and close the loop. 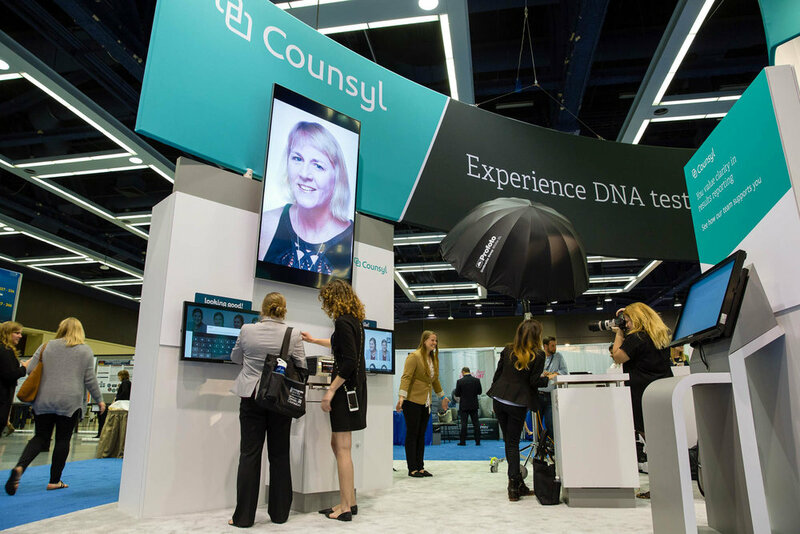 That gave Counsyl the opportunity to connect with the attendees in a casual, low pressure way while at the same time reinforcing their branding and product messaging to attendees. As mentioned previously, we also built Counsyl a custom branded sign-in form that collected the very specific information that Counsyl needed to qualify their leads. This allowed their team members to see, in real-time, who was and wasn't qualified, in addition to the face-to-face context they were getting in the casual conversation at the beginning and end of the line. So, there you have it. For the cost of our Standard Set (plus prints), the Counsyl team was able to use the traffic from our Headshot Booth to keep their large exhibit space humming for three straight days. Each guest was able to experience the Counsyl brand and services in an organic, low pressure way, and for their time they receive several magazine quality LinkedIn headshots. How will you make the most of your Headshot set?